One of my favourite posts of the year! It's time to trawl through the shelves and have a look at some of the best cookbook releases of this year. I haven't noticed as many cookery programmes on television this year as usual but there are a few TV tie-ins worth taking a look at. One very exciting release this year has been from fellow blogger Karen Burns-Booth. Get writing those wish lists! Born out of the horrific fire that engulfed the Grenfell Tower this book brings together recipes created by the Hubb Community Kitchen. There's recipes for all meals and snacks throughout the day. Each recipes tells the tale of the life of the person who created it. All profits from this book will go benefit Hubb Community Kitchen. No foodie trip to London is complete without a wander around Borough Market. Celebrate a year of seasonal cooking with recipes inspired by the produce on sale at the market. Find out about some of the traders and the ancient history of the market. Many of you will know Karen from her brilliant blog Lavender and Lovage and her cooking challenges such as Tea Time Treats. In this book she brings together her passion for seasonal and regional food and recipes. All the photographs are shot by Karen in her own beautiful style. From Great British Menu to Great British Bake Off Prue Leith is now a familiar figure on the TV. She has a lifetime of experience in food including running a cookery school. This book brings together Prue's favourite dishes that anyone can follow and recreate. The teenager baker charmed millions week in, week out with his creations on last year's Great British Bake Off. This led to his own show on Channel 4 and this book to accompany it. Discover fun and informal bakes to be shared with friends plus a few showstoppers. Known for his hard hitting criticism on Masterchef Tom Parker Bowles is also a well respected food writer. Get this book to prepare the most scrumptious of feasts this Christmas with a little help from the heritage of Fortnum and Mason. There's also some healthy recipes to get you back on track in January. Classic French recipes turned from rich and heavy dishes turned into light and easy to make family meals. Michel Roux Jr looks to his French upbringing and adapts his favourite meals suitable to made at home everyday. Perhaps not a household name but cookery book enthusiasts will know Diana from her previous books plus her regular column in the Daily Telegraph. If you have ever struggled to put a menu together with food pairings that complement each other this is book for you. Pick from a selection of menus and recipes that travels the world and different seasons. Few years go by without me receiving a new Mary Berry book. This one is re-issue of an old one but is fully updated with new photographs. Perfect for the baker without much time or if like me has to make up to10 cakes for one bake sale! Perfect for the cold winter months as this urges you to take the time over preparing your food. Find stews and roast and indulgent bakes. You'll also learn the techniques for making your own pasta, noodles and pastry. What books have you got on your Christmas wish lists? 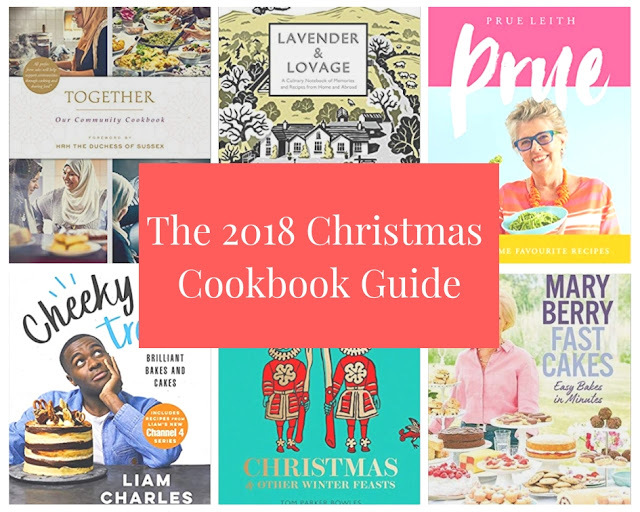 Have you bought any new cookbooks for Christmas recipes? This post contains affiliate links. It won't cost you any extra but it will help me buy more cookbooks. Good selection there. I much prefer a book or print off than reading online.